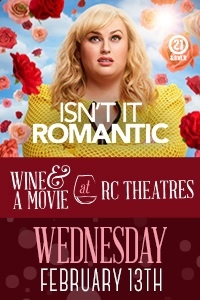 RC Theatres Presents: Isn't It Romantic Wine & a Movie is coming soon!Sign up to be notified when tickets go on sale near you. usheru will use your email to let you know when tickets for RC Theatres Presents: Isn't It Romantic Wine & a Movie go on sale. Gather your friends and join us for an early Valentine's Day celebratory night out with a special showing of ISN'T IT ROMANTIC, the hilarious new movie starring Rebel Wilson as a young woman disenchanted with love who mysteriously finds herself trapped inside a romantic comedy. The commemorative wine glass is yours to keep! Enjoy a wine reception followed by the movie. THIS IS A 21 AND OLDER EVENT; ID MUST BE SHOWN FOR ENTRY; NO EXCEPTIONS.Note: Lexington Exchange Movies 12 and Westminster Movies 9 ticket prices do NOT include glass of wine due to local restrictions. Wine can be purchased by the glass for $5.00/glass.